There’s quite a bit of hype around bone broth at the moment – and there’s good reason for it! 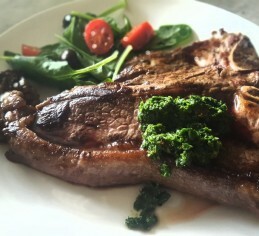 There is a growing recognition of the health benefits of slow cooking and cooking with bones. 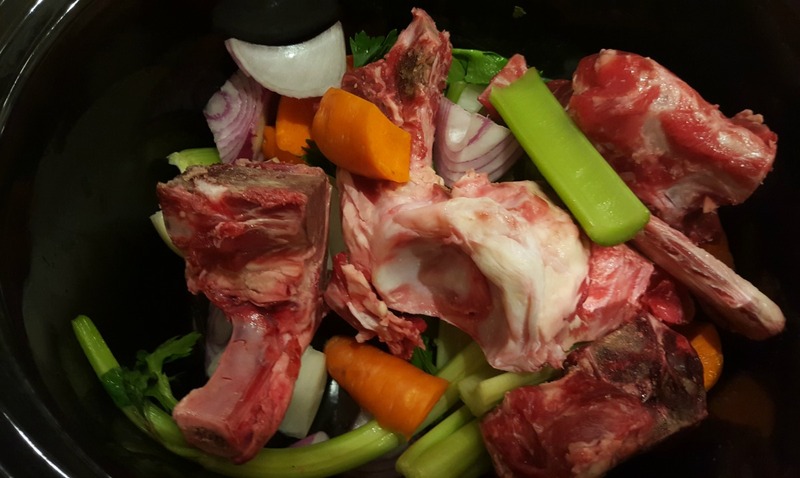 Making bones broths is great because of the nourishment and health benefits it provides, but also because it helps to make use of more of the animal, which helps us to be more sustainable in our eating. 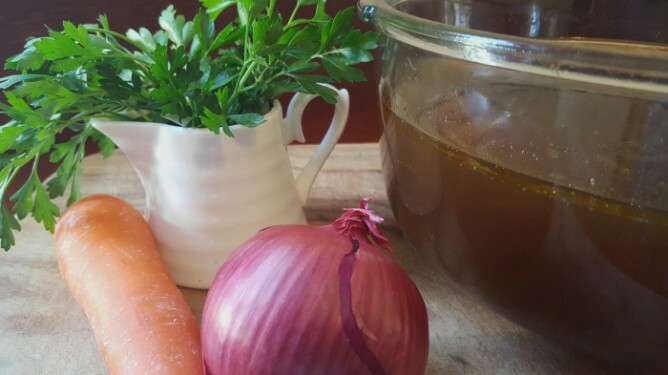 Derek and I often talk with our customers about the benefits of cooking with bones – so we thought it was time to share a bone broth recipe with you. (Although going by the number of our customers that order bones with their hampers, many of you already know!). 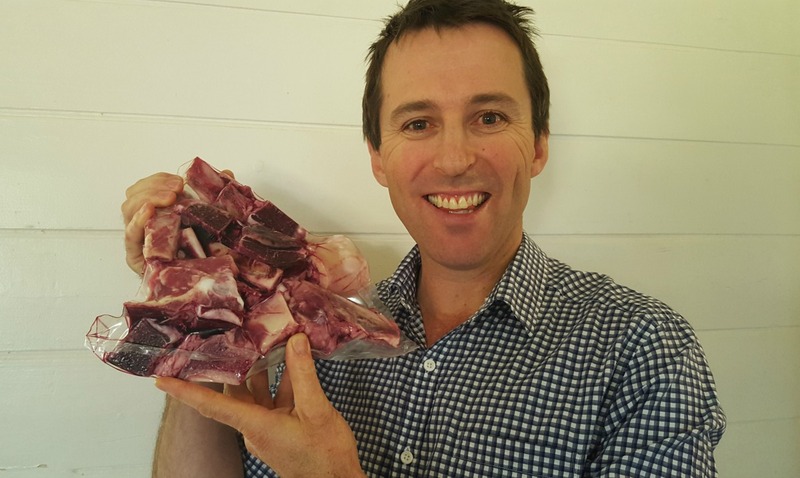 Before I go into the how to’s – if you aren’t aware of the wonderful health benefits of the gelatine that is released from collagen rich cuts of beef and bones, then check that out here. For those that already know, let’s start with your choice of bones. Slow cooking with bones brings out the goodness of minerals and gelatine into the broth. It can also however bring other nasties out of the bones if you don’t have good quality bones. The nature of how our bodies function is to eliminate any toxins that enter our system as best as possible – through means like our skin, urinary tract and colon. If such systems become overloaded, the body can then store these toxins away from the important parts of the body (like the brain and blood), and stores them in places like fat or bone, where they are of less risk to the functioning of the body. A cow is similar, in that any toxins that enter the body need to be stopped from circulating through the body and can, among other places, end up in the animal’s bones. So you can see the problem if animals have been exposed to chemicals, pesticides and heavy metals. Slow cooking can then release these toxins from within the bones. This is why we say it is essential when cooking with bones, to choose bones from animals that have been raised in a chemical free environment. So, for the bone broth novices , here we go! A variety of grass fed beef bones (In our beef bone packs our customers receive a mix of knuckle bones, neck bones, rib bones & hip bones – so you will get a good mix of marrow bones, gelatine bones and meaty bones). 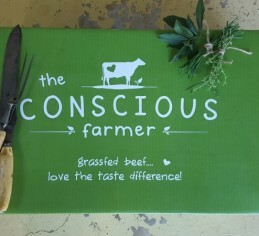 (You can also add bay leaves, garlic, rosemary, leek or other flavours you like). Place the bones in a slow cooker or crock pot and cover with water. (Make sure the water is a few centimetres from the top, as it will expand during cooking). Add the apple cider vinegar and let stand for an hour. The vinegar helps to extract minerals from the bones. I always choose an unpasteurised good quality apple cider vinegar. 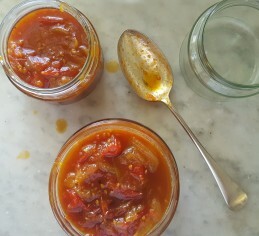 (Many recipes will roast any meaty bones before adding to the pot – which is just for added flavour). Add vegetables, thyme and pepper. Turn the slow cooker on and bring to a very slow simmer – one where you can barely see the surface moving. You may need your own judgement here as to the setting to use. My pot has two settings – high and low. The low is great for bone broths and I use the high setting for stews. As the broth cooks – periodically skim off any scum that may form on top. Simmer for 12 to 72 hours. Add a bunch of parsley for the final 10 minutes of cooking. Remove the bones and big vegetable pieces with tongs. Pour the remaining stock through a sieve or colander to strain. You should now have a relatively clear broth or stock. Place into containers in the fridge. As the stock cools, a layer of fat will set on top. (You can see the unset layer on the top of the broth in the image above). The fat can either be discarded or kept for cooking with. Note that fat is similar to bones – make sure you choose good quality because it can be a store for toxins in the animal’s body, as I mentioned earlier. You can also place stock in the freezer for longer keeping. Once cooled properly in the fridge the stock should be gelatinous, but just how set will depend on how concentrated the stock is and the combination of bones used. Sometimes mine sets quite solid while other times it is a loose jelly. Either way, it is somewhat set – so I know that the wonderful nourishing properties of gelatine are present. Be sure to add some sea salt to whatever dish you use the stock in, as this stock/broth is not salted as the store bought kind is. Enjoy in soups, stews and gravies or just drink alone for good health. 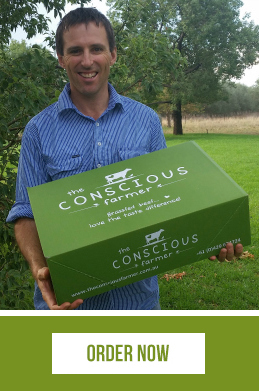 Many of our customers are choosing to add some bones to their grass fed beef hampers. Our bone packs come in vacuum sealed bags. We generally pack them in 2kg bags, which is what you see here with Derek. Cooking bone broth doesn’t take a lot of your time, but it does take a bit of time – so it’s an experiment in being organised. Only those prepared to be patient can reap the health benefits of a bone broth!